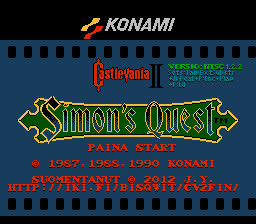 Castlevania II: Simon’s Quest is an action role playing game for the Nintendo Entertainment System. 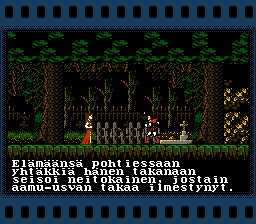 This is a Finnish Translation of Castlevania II: Simon’s Quest. 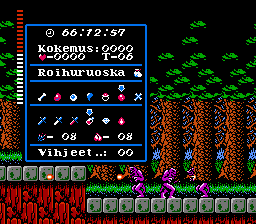 In additon to translating the ROM, an in-game map is added, and the Japanese staff credits were re-added to the game. The patch is for the NES version. The translation is based on the original Japanese text. According to the author, extensive research was performed on the meaning of the sometimes cryptic original Japanese text in the game, and special attention was paid to make sure that all the translated text makes sense and is understandable, without undermining the loyalty in translation to the original Japanese game. Added dialog in select locations - Small changes that will improve the game experience without changing the nature of the game. 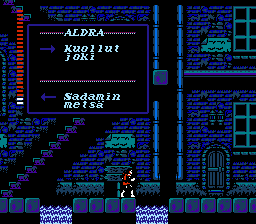 Reintroduced some features that the English releases removed from the Japanese version - Includes the extended ending text, as well as Konami-style Start text on the power-on screen. Map function - An in-game map is included. It helps understand the layout of the game world, and to know the name of whichever place the player currently is in. 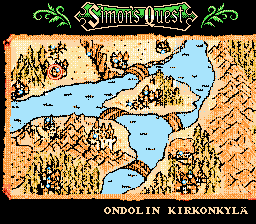 It compensates for the lack of actual game manual, which in the Japanese releases included a map. Press the select button to view the map in the game. SRAM save function - Game can be saved at any time into internal battery-backed memory and loaded later. Advanced password encryption - Passwords that are encrypted with extended functionality, can be decoded by the original (English) versions of the game. The function expands the repertoire of passwords.